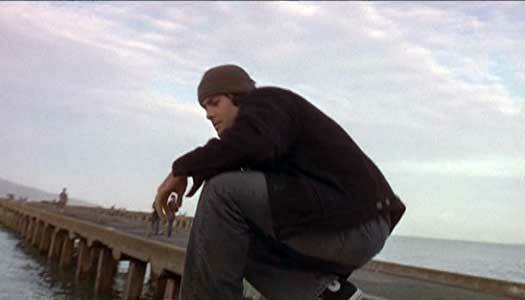 Innis Casey wears black high top Converse “Chuck Taylor” All Stars in the film. Anthony Verdi is an aspiring young musician in San Francisco. Swing is the story of Anthony Verdi (Innis Casey) a young twenty-something musician who wants to pursue his dream of writing and performing music full time. He has a trio that consists of himself on guitar and vocals, Martha (Mindy Cohn) who is his roommate and plays bass in the band, and Mac (Adam Tomei) on drums. But Anthony’s father (Tom Skerritt) has other plans for him. He wants Anthony to work long hours and help him run the family grocery store. We also meet Valerie (Dahlia Waingort), Anthony’s very practical and business-oriented fiance who is mostly consumed with her work although the couple is able to make some time for romance. 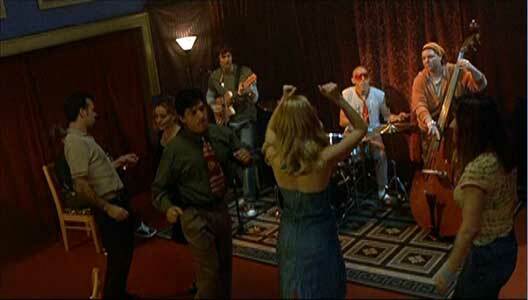 As the film opens, Anthony is hanging out at a local swing club because he really likes the band playing there. Tina (Constance Brenneman), an attrractive young lady, strikes up a conversation with him. When she asks him “Do you swing, or do you just look the part?” he gives her the second answer. “You don’t know what you are missing,” Tina replies as she walks away. Anthony helps his Uncle Bill at his nursing home. 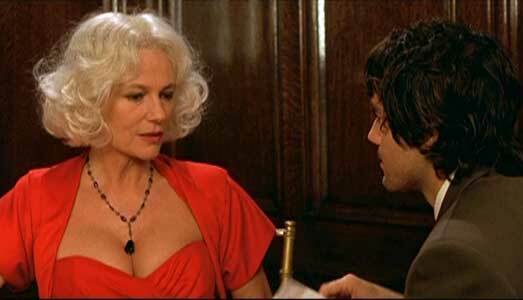 The film then cuts away to a nursing home where Mrs DeLuca (Jacqueline Bisset) is grooving to a swing record. She is in failing health, and ends up collapsing from the exertion. 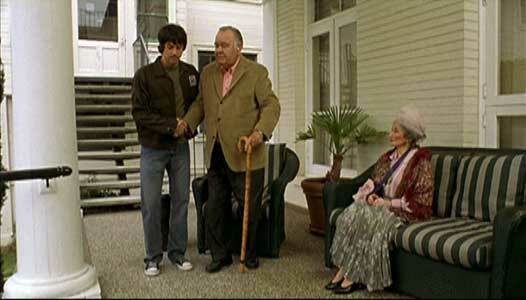 She is helped up by Bill (Jonathan Winters), who is Anthony’s great uncle and also lives in the home. The two are admonished by nursing home worker Grace (Nell Carter) to be careful or she will have to take the phonograph away. Mrs. DeLuca decides to give Bill a couple of her favorite swing albums whle she still can. Later, she passes away, and we see the grief that Bill feels for her long time friend from junior high days. Anthony takes Bill to the funeral where he runs into Tina again, who turns out to be Mrs. DeLuca’s granddaughter. After dropping off Bill, Anthony loses track of time and is very late in picking Uncle Bill up from the funeral service. When Anthony offers some phony excuses on why he was late, Bill tells him, “Please don’t ever lie to me about this or about anything important in your life.” On the way home, Anthony hears a radio ad for a swing dance being held at Club Jimbo, and so he decides to check it out. The club turns out to be a complete throwback to the 1940’s complete with big band, patrons dressed up in suits and formal dresses, and one dollar Manhattans. Anthony discovers Club Jimbo, a night club that appears to be unchanged from the 1940s. At the club Anthony meets Christine (Jacqueline Bisset), an accomplished swing dancer who offers to teach him how to dance. His first lesson is a success and the two agree to meet again in a week. As the lessons continue, Anthony becomes more enthralled with swing dancing and with Christine, leading to a gradual estrangement from Valerie who doesn’t like swing dancing or night life in general. Anthony is also becoming more at odds with his father, who wants Anthony to get more serious about his work at the store, and stop working at night clubs. Meanwhile, at Club Jimbo things are getting more serious between Anthony and Christine. 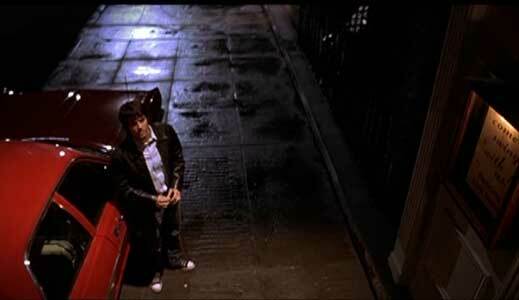 When Anthony brings Christine a song he has written for her, and tells him that she is his angel, Christine tells him that yes she is his angel but their time together is coming to an end. “You have important things to get on with out there.” These three storylines intertwine and come to a head when Anthony and Christine participate in a dance contest at the club and when he takes her to the door to leave, the outside daylight pours in and he discovers that Club Jimbo was a fantasy. Now Anthony must decide for himself how to deal with his father, his musical career, and his impending marriage to Valerie. Anthony meets Christine at the club, who teaches him how to swing dance in style. Swing is an interesting attempt to make a movie out of a musical genre and a couple of overplayed plot devices — angels intervening in a confused young person’s life and the conflicts between family members who disagree on whether or not a musical career is a viable way of earning a living. One ironic thing about this film is it could have had its basis in some of the contemporary swing bands that are still performing in the style, like the club band you hear at the beginning of the film and at its end, instead of giving us a fantasy world complete with bands and musicians out of the 1940s. But this doesn’t stop your admiration and enjoyment of the well done swing musical numbers and dance sequences that permeate the film. The second ironic thing is that although young Anthony is an admirer of swing music, none of that style seems to carry over into his own music, which is pretty average sounding, and has very little of the energy you hear in the aforementioned swing bands. Come on, Anthony, it don’t mean a thing if it ain’t got that swing! It is surprising that more attention wasn’t paid to this very important detail. Writer Mary Keil’s script also seems to miss out on what normal musicians living in San Francisco would do at Anthony’s age -- take advantage of all of the educational resources in town including the incredible array of talented musicians as teachers. That’s where the whole conflict between Anthony and his father falls flat. If the best you can do is get an occasional $100 gig, keep your day job. If you want to learn the art, get some training and lessons. And, if you do have engagements, can’t you schedule your daytime work hours accordingly? The other main flaw in the script is how the Club Jimbo fantasy is never really explained. It seems to be happening over several weeks, but there doesn’t seem to be any rationale as to how Anthony comes and goes from this state. Is it a dream or what? Did it come from listening to Mrs. DeLuca’s records or did he secretly take swing dance lessons? Much of Swing is salvaged by the wonderful performances delivered by the veteran actors in the cast. Jacqueline Bisset is superb as the dying Mrs. DeLuca and the angelic dance instructor Christine. After seeing Jonathan Winters as Uncle Bill, you regret that he isn’t appearing on television any more. Nell Carter steals the musical show with a great vocal rendition of “Is You Are, or Is You Ain’t” (Anthony take note!) in her last film appearance before her death. And we also see Barry Bostwick and Tom Skerritt give credible performances as Christine’s companion angel and Anthony’s father respectively. Innis Casey has the “look” of the contemporary musician, and a pleasant and engaging personality, which is what the producers must have wanted, but not quite the talent to make the musical side of his role totally believeable. The San Francisco Bay Area settings are beautiful and director Martin Guigui keeps the pace moving most of the time. If you can overlook its flaws, Swing is a pleasant diversion that you will enjoy viewing. Anthony would like to work full time with his trio, instead of at his dad’s grocery store. 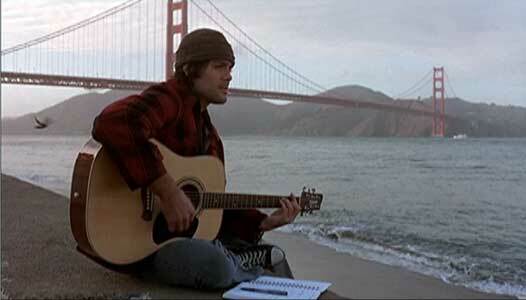 Anthony dreams of performing his guitar, as he wanders around the Golden Gate Recreation Area. Innis Casey in his role as Anthony wears black high top chucks throughout most of the film. This helps to emphasize his musician side, as black high tops are the choice of many great musicians. 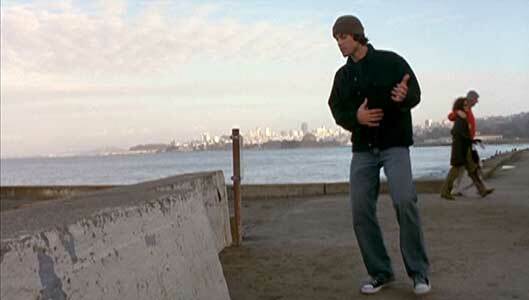 The best chucks scenes are when he is wandering around the Golden Gate Recreational Area in San Francisco, and musing about his dream to be a full time musician. Anthony climbs down from a pier on San Francisco Bay. Swing. (2003) Innis Casey, Jacqueline Bisset, Barry Bostwick, Jonathan Winters, Nell Carter, Tom Skerritt, Constance Brennerman, Dahlia Weingort. Directed by Martin Guigui. Categories: Comedy, Fantasy, Romance.